By default, speaker volume on your Google Glass is set to 100 percent. Because Glass makes sounds the first time you turn it on, you’ll know whether this speaker setting is too loud or just right. 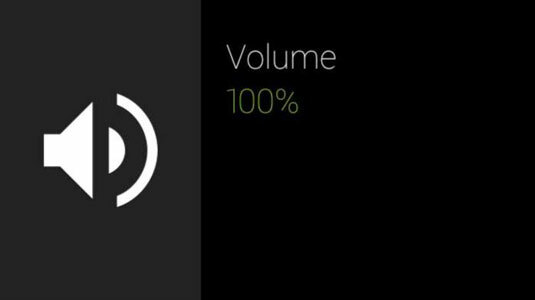 Changing the default volume setting is easy. Just tap the Settings card bundle; tap the Volume Settings card; and then slide your finger forward and backward on the touchpad to move the onscreen volume slider. When you release your finger, the slider disappears, and the speaker chimes so that you can determine whether the new volume is right. If you need to adjust the volume more, tap the Volume Settings card again and reset the slider.